Today is My Birthday, so what better way to celebrate than with a Paula Deen Cake!!!! I just love Paula's Chocolate Celebration Magazine because there are so many recipes to choose from. 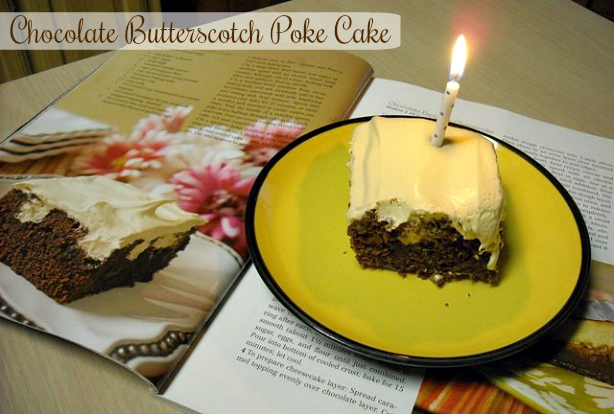 I have been eyeing this Chocolate Butterscotch Poke Cake for awhile now, so I decided that would make this cake for my Birthday. Well, a promise is a promise so I had to bake it. This cake isn't anything fancy and doesn't look like your traditional birthday cake however there was just something about this cake that was so appealing to me. The first time I opened Paula's magazine it was definitely a WOW moment for me when I saw that cake. Not sure if it was the butterscotch sundae topping that you drizzle all over the warm cake or if it was the creamy frosting made with Butterscotch Pudding and whipped topping that got me, but it definitely looked like a delicious cake. This cake was so good that I could of ate the frosting alone. My son and daughter were both fighting over who was going to get the bowl to lick the frosting, I'm the birthday girl so actually I should of gotten that bowl. I was adult about the whole thing and gave the the bowl and I took the spatula. If you don't have her Chocolate Celebration Magazine, you don't know what you're missing. This magazine is a chocoholics dream!! Preheat oven to 350. Grease and flour a 13 x 9 inch baking pan. In a large bowl beat butter and sugar at medium speed with an electric mixer until creamy. Add eggs one at a time, beating well after each addition. Beat in vanilla. In medium bowl combine flour, cocoa, baking soda and salt. Gradually add to the butter mixture alternately with milk, beginning and ending with flour mixture. Spoon into prepared pan. Bake for 25 minutes or until a wooden pick inserted in the center comes out clean. With the handle of a wooden spoon poke holes halfway through the cake in half inch intervals. Pour ice cream topping evenly over cake. Let cool completely. In a large bowl combine whipped topping and butterscotch pudding mix. Spread evenly over cooled cake. Cover and refrigerate cake before serving. Refrigerate any leftovers. I'm ending this post on a sweet note. This is the present my 9 year old daughter Mackenzie made me. It's so cute and so thoughtful. She loves all the Disney princesses, so she colored me one of her Belle coloring pages and left a little note with a dollar bill attached that she saved. I told her to keep it but she said no mommy it's your birthday and insisted! HAPPY BIRTHDAY!!!! I hope your day was very special! Paula Deen is my favorite too!! I subscribe to her magazine, but I dont have the chocolate one, I will get it though!! !The cake sounds and looks scrumptious!! Hi Patti, awee look at the picture of you and your grand daughter. That is a awesome picture. I had a pretty good day we just ordered pizza and had this yummy cake so pretty relaxing. Oh I forgot i just added a picture to the post. My daughter made me a cute picture for my bday she is always sweet like that. I would like a virtual slice please! Happy Birthday! Sounds like you had a great day! And I love the look of that huge square chocolate cake on the cover of the magazine. Mmmm, resisting the temptation to make a cake this evening will be difficult (but I have to, I've been sick the past couple days because I stay up late eating sweets!). First off, Happy Birthday!!! I love your blog!!! Seems we have some things in common - both from Texas and both love Paula Deen!!! I swear, she talks just like my mother!!! And they both act like each other!!! Crazy ladies!!! Here's one of my favorite cakes - let me know if you ever give it a try. Here's hoping your day was as special as you are! Happy Birthday! What a cute gift! LOVE the cake. This cake looks so yummy! Can't wait to try it! Well I hope you had a great Birthday! 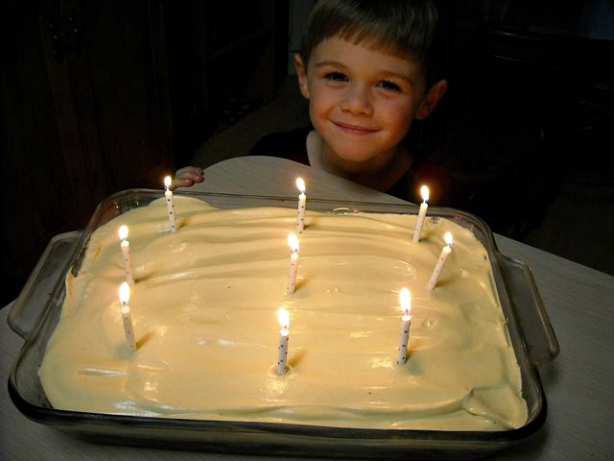 I make a cake like this, and in addition, it calls for Sweetened Condensed Milk (YUMMY!) and Butterfingers! That cake looks so darn YUMMY! It is my Birthday today too! Happy Birthday!!! I hope you had a wonderful day!~Smiles~Tam! Happy birthday!The cake looks gorgeous.Hmm can i have a bite? Happy Birthday. Hope you have a wonderful year! Happy Birthday... a little late! I hope you had a great one. With that yummy looking cake I'll bet you did. I love Paula Deen. She cracks me up. Thanks so much for visiting my blog and adding me to your blog roll. I am honored because your site it out of this world! Happy Birthday late! Figures I missed something good for not checking in yesterday! I love Paula Deen too and her gooey butter cakes. Which one of those is your favorite? I never got the chocolate issue either so I'll have to get my hands on one! I am a chocoholic for sure! Hope you had a happy birthday. It was mine too even if I am probably old enough to be your mother. Never did bake myself a cake this year but have been taken out to dinner 3 times. Guess I'll have to call the banana nut bread (Southern Plate recipe) my cake. Your cake looks good - love Paula Deen - she's a hoot! Thanks everyone for the Happy Birthday Wishes. I did not mind making my own Birthday Cake, Sometimes i have to if i want it to be edible. My dh and kids have tried baking me a cake before and lets just say its better for me to bake it LOL. Heidi I love your blog and I am happy to add you to my blog roll. You have some great recipes. Tam & Pam oh lok that rhymes Pam Happy Birthday to you too!!!!! Pam not sure if you are old enough to be my mom I am getting up there and the years are flying by this was my 43rd Birthday I cant believe it. Man that looks good! I am gonna have to make this for my husbands birthday! Happy Birthday! Cake is always a must for a birthday. This one looks fabulous. Enjoy your day! Just wanted to wish you the most special birthday Tina! I love reading your blog! That's like Good vs. Evil! Happy Birthday! that lil one is so cute! i love paula deans recipes! Mesa para 4 (Table for 4) I left you a nice comment on your blog. Thank you so much for stopping by and from so far away. Portugal, Europe. My husband showed me how to go to google and translate your whole blog how cool was that. I could read everything. The Penne with chicken looks so good and the bread. I do hope you come back again visit. I am going to try and make something from you site. I just have to figure out the measurements, as they are different. Hi there--I didn't see this post until now although I check your blog from time to time and always enjoy it. In this particular case, I was thrilled to see that we share a birthday! Happy belated birthday from a fellow March 11 Pisces. Monika, Happy Belated Birthday. I hope you had something yummy and sweet on your special day. I wanted to make this for my dad's birthday later this week...Is it absolutely imperative I use Cook & Serve pudding, or will instant work? I can't find Cook & Serve butterscotch anywhere!!! Good Luck and lmk how it turns out with the instant pudding. I am so glad you found the pudding and that everyone loved the cake. Yeah!!! Delightful cake!!! It is very Delicious, Thanks for offering so simple recipe that everybody can understand.